As per latest BOM forecast, the tropical cyclone Riley (ex-tropical low 12U) is currently located offshore northwest of Broome. This tropical cyclone is likely to move in a West South Westerly direction and expected to reach a Category 3 intensity tropical cyclone on Saturday. Environmental conditions are favourable for the system to accumulate an abundance of moisture along with it as it moves along the coast. This stage involves extensive communications and consultation between the Dampier Harbour Master, Port Terminal Operators, Port users and Pilots. Operational plans, sailing drafts, tidal requirements and intentions will be discussed and evaluated against possible response scenarios. The Port Of Dampier will move to Cyclone Stage 3 – Clear Port from 24th Jan 2019 / PM. The intention is to have the port cleared by 25th Jan 2019 @ 1300LT. The weather forecasts will continue to be monitored with further advice to be issued on 24th Jan 1600 hrs or earlier if there is a substantial change/escalation to the situation. The response plan accounts for time required by vessel's to clear the port as directed by the Harbour Master. Please see below important information from the Harbour Master of Pilbara Ports Authority of Port Hedland in regards to Cyclone Alert Stage 2 – System 12U – Prepare – Update 4. The PPA – Port of Port Hedland cyclone response procedure has been activated. 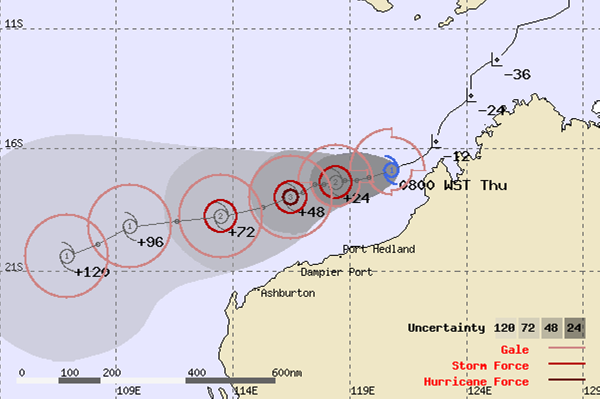 The Port of Port Hedland remains at Cyclone alert Stage 2 – PREPARE. As of 1500 WST 23 January, the BoM has issued guidance forecast for Tropical Low 12U. The system is forecast to continue tracking in a South-Westerly direction and parallel to the Pilbara Coast over the coming days. The Tropical Low is expected to continue to intensify overnight and into tomorrow with a possibility of reaching Tropical Cyclone strength sometime tomorrow. The chance of a coastal crossing in the vicinity of Port Hedland continues to become less likely. Regular communications with terminal operators and key service providers remain ongoing. Terminals with ships alongside are to ensure vessel load plans are actively monitored. Swell generated by the passing tropical system is expected to arrive at the Port over the next 36 to 48 hours and vessel draughts will need to be managed accordingly. PPA will not approve any main engine immobilisation requests. 2 x Jack Up Barges related to the Channel Marker Replacement Project are in the process of being de-mobilised as per the contractor’s cyclone management plan. Terminal cyclone plans should be activated consistent with PPA expectations. The BoM guidance track map as of 1500 WST 23 January is attached for information. PPA will continue to monitor the Tropical Low with the next update to be provided PM 24 January or earlier if required.